Squatty Potty Unicorn Gold Reviews - Best Toilet Spray? With its blend of essential oils and gold nanoparticles, Squatty Potty Unicorn Gold claims to rest atop the surface of the water and neutralize unwanted odors as they attempt to pass. What Is Squatty Potty Unicorn Gold? Advertised as a ‘before-you-squat’ poo spray Squatty Potty Unicorn Gold contains a proprietary blend of essential oils and real gold nanoparticles that promise to help trap odors beneath the surface of your toilet’s water, and leave a pleasant odor in their place. We’ve all been—at least a little—embarrassed at one point or another when using the restroom in public, whether at a friend’s or co-worker’s house, during regular business hours at the office, a holiday gathering, or just out at the mall. But, if you can carry a product like Unicorn Squatty Potty Gold with you at all times, the website makes it seem like you can rest easy by eliminating unpleasant odors in advance, along with any potential shame in the process. But is it necessarily your best option? In other words, are there competing bathroom sprays that might deliver equal—or even better—value for the money? This is the central question we’ll help you answer in this brief article. Gold vs. Essential Oils: How Do Products Like Squatty Potty Unicorn Gold Work? There’s no need to overcomplicate things here since the basic premise behind toilet sprays isn't exactly rocket science. Instead of maintaining a porous layer of air between the *ahem* odors in your toilet water and the air above, these products create a thin film on the surface that prevents these smells from easily rising. How? Basically, essential oils don’t mix easily without water (or, not at least without an emulsifier as an additive), so they rest on top. This way, as odors rise out of the toilet, they’re intercepted by this barrier and also covered up as any small particles happen to escape. In layman’s terms, these oils block odor-containing molecules from rising out of the toilet water. But do Unicorn Gold’s gold nanoparticles make a meaningful difference from this perspective? While copper has been used for millennia due to its natural antibacterial benefits, we didn’t encounter any clinical evidence on sites like WebMD or the Natural Medicines Database indicating that gold—whether measured in nanoparticles or otherwise—has any similar benefits, or that it’s especially useful at masking bathroom-related odors. But, will you pay meaningfully more for Squatty Potty Unicorn’s gold nanoparticles? Let’s dive into these details in the following section. How Much Does Squatty Potty Unicorn Gold Cost & Where Can You Buy? All direct orders ship for a flat rate of $4.95, although UPS 2-day expedited shipping is available for $9.95. Orders shipped to Alaska, Hawaii, and US Territories will be charged a flat shipping rate of $29.95. We also found many of Squatty Potty Unicorn Gold’s formulas for sale through popular third-party retailers like Amazon, Bed Bath and Beyond, Target, ACE Hardware, and Costco for about the same prices. All direct orders come with a 60-day return policy, less S&H, which you can request by reaching out to customer support at 855-628-1099 or info@squattypotty.com. What Can We Learn From Squatty Potty Unicorn Gold Customer Reviews? We encountered nearly 1,500 online customer reviews for Squatty Potty Unicorn Gold’s formula on Amazon at the time of our research, who had cumulatively given the toilet spray an average rating of about 4.3 stars. There, common compliments frequently related to ease of use, effectiveness at neutralizing unwanted odors, and pleasant smells, while the relatively few complaints often revolved around inefficient odor masking and less-than-stellar scent preferences. While we didn’t encounter any other options advertising the inclusion of gold nanoparticles, we did come across several other popular toilet spray formulas competing for many of the same customers as Unicorn Gold. These are in addition to the wide variety of DIY toilet spray and dropper recipes available from third-party websites. In many instances, these often don’t contain more than a couple of ingredients (e.g., rubbing alcohol and essential oils) that can be purchased for meaningfully less than a penny per application. Given all of this information, what’s the next most logical step when it comes to Squatty Potty Unicorn Gold? We’ll conclude in the next section. Is Squatty Potty Unicorn Gold the Right Toilet Spray for You? While we didn’t test any formulas ourselves, the reality is that the right bathroom odor masking spray or dropper is mainly going to come down to which ones a) effectively mask unpleasant bathroom-related odors, and b) match your personal smell preferences. Unfortunately, you won’t be able to accomplish either of these with a bathroom spray before handing over your hard-earned money. Pay close attention to online customer feedback – The more, the better. After all, common compliments and complaints can go a long way toward indicating what you might expect after becoming a customer yourself. Make sure you can get your money back – Except in rare circumstances, most reputable manufacturers will stand behind their products with at least 30-day satisfaction guarantees, with (ideally) no restocking fees. Reasonable S&H charges – If you’re paying more than 30% of the purchase price in shipping fees, it might be worth considering whether or not the company is making more money off of transportation costs than is reasonable. Pulling all these facts together, there’s little doubt that Squatty Potty Unicorn Gold comes with a fantastic marketing campaign that makes you want to learn more. Compared to other toilet sprays, it also seems to come with a reasonably competitive price, as well as almost wholly positive online customer feedback. 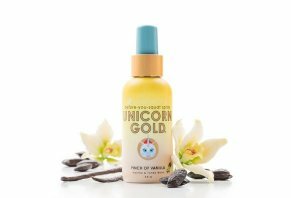 It’s important to balance these positives by emphasizing that it doesn’t appear Unicorn Gold’s nanoparticles will deliver meaningfully better odor trapping or neutralization than standard alcohol and essential oil formulas. But, if you end up rolling the dice and find that Squatty Potty Unicorn Gold’s formula doesn’t meet your odor-reducing needs, the company seems to stand behind it with a 60-day satisfaction guarantee. Like any other return, though, just keep in mind that you’ll have to pay for shipping back to the manufacturer. Write a Review for Squatty Potty Unicorn Gold!